The products whose human growth hormone formulas have undergone double-blind placebo-controlled IGF-1 clinical trials to measure effectiveness are listed below. IGF-1 levels are used to measure the amount of human growth hormone in the body. If a brand is not listed below it's because that brand has not had any legitimate IGF-1 clinical studies to prove whether it can actually increase human growth hormone in the body. *If you compare the results of Nu-Spring and PRO-Symbio Plus you will notice that it appears they reported some of the same results. For instance, Nu-Spring's patient 4 is identical to PRO-Symbio's patient 2. Perhaps both brands use the same formula. 1 135 on 4/8/97 279 on 9/2/97 +74% 27 Days? 5 357 on 1/24/97 388 on 1/25/97 +8.5% 1 Day? 6 167 on 1/24/97 178 on 1/25/97 +7% 1 Day? 7 242 on 1/25/97 273 on 1/27/97 +12.5% 1 Day? Research Studies- In outcome based research studies performed on 20 subjects supplementing with BioGevity for up to 26 weeks, 75% of subjects (15 people) experienced a 41% average increase in IGF-1 levels (insulin-like growth factor-1, a stable indicator of Somatotropin levels). The Specifics of our ProBLEN IGF-1 Clinical Studies. 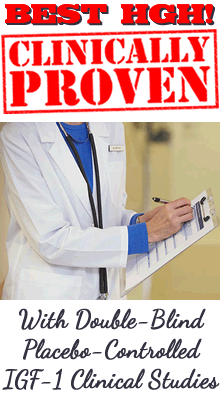 Information About Proper IGF-1 Clinical Testing and the False or Misleading Reporting Some Use. Our Pharmaceutical Lab's Survey of Clients Taking ProBLEN Human Growth Hormone.